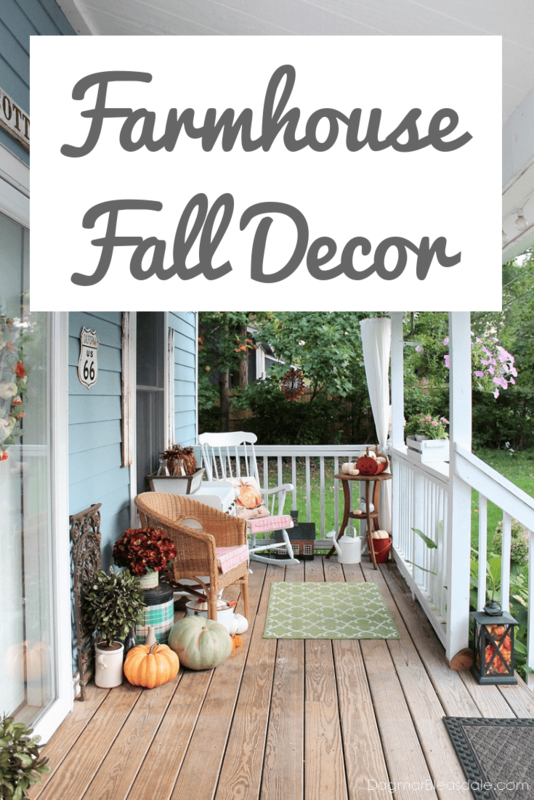 Welcome to the Blue Cottage fall home tour full of lovely and affordable farmhouse decor! I can’t wait to show you what I have come up with this year! 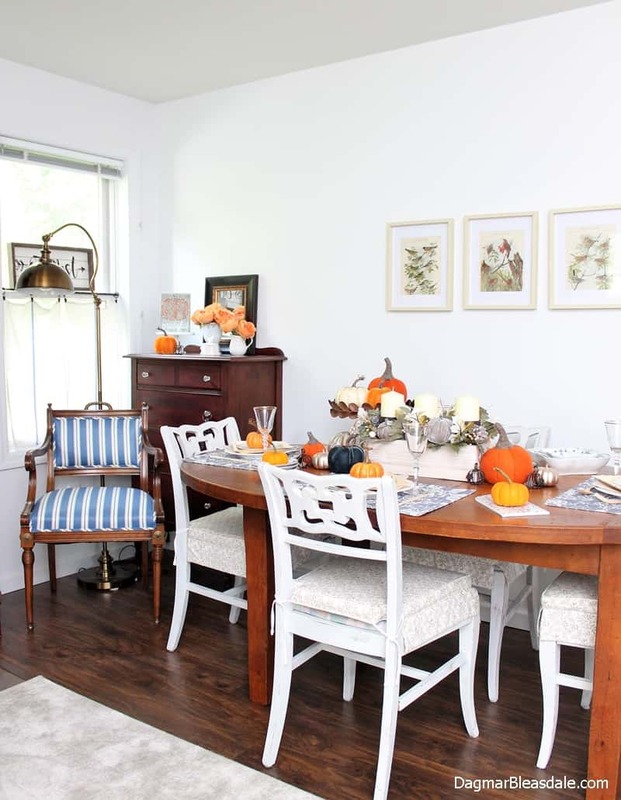 Blue Cottage Fall Home Tour – Come on In! 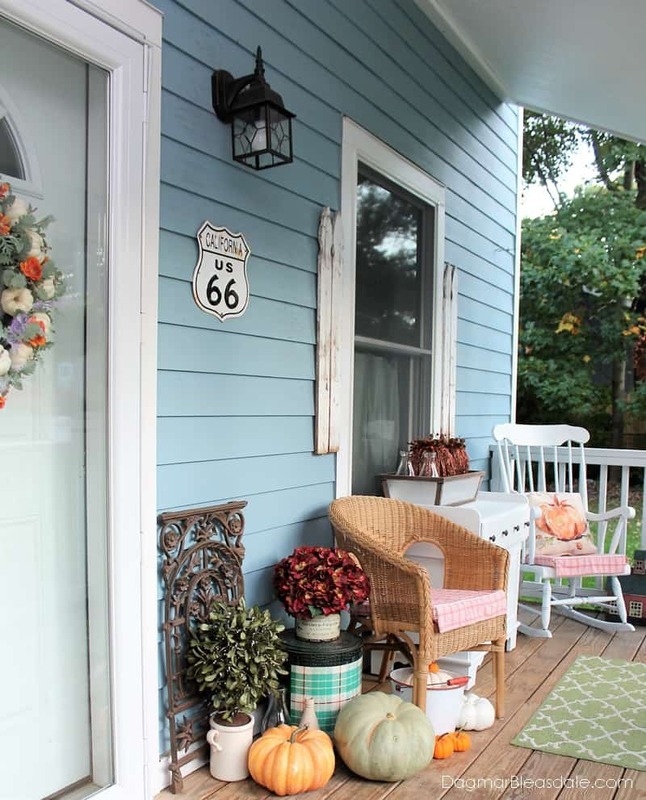 Did you catch the “COTTAGE” sign over our door? I bought it at the Country Living Fair this year and put it up a few weeks ago. 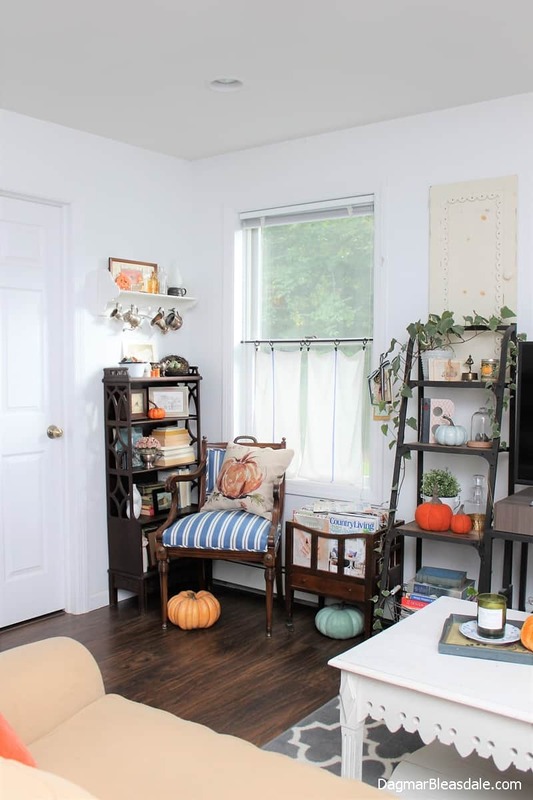 You know me — many of the items I decorate our home with I bought at yard sales and thrift stores over the years for just a few dollars. 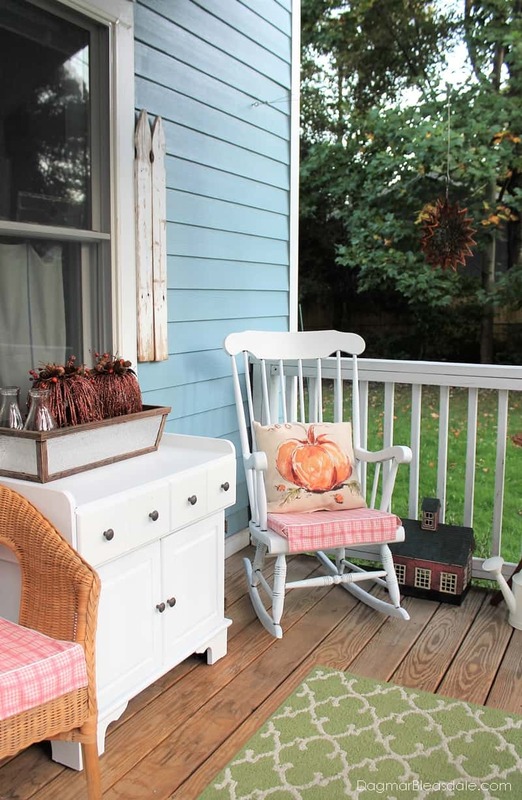 The storage cabinet in front of the window has been on the porch for a few years. I picked it up at a yard sale — I think it was given to me for free — and it holds gardening supplies. It was dark brown and all scratched up as you can see in these pictures, and I finally painted it white. 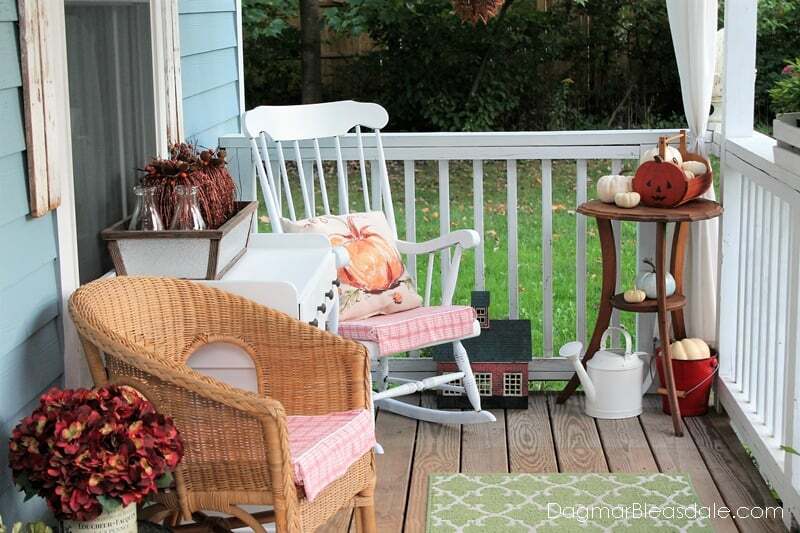 While the paint was drying, I also painted my mother-in-laws rocking chair white. 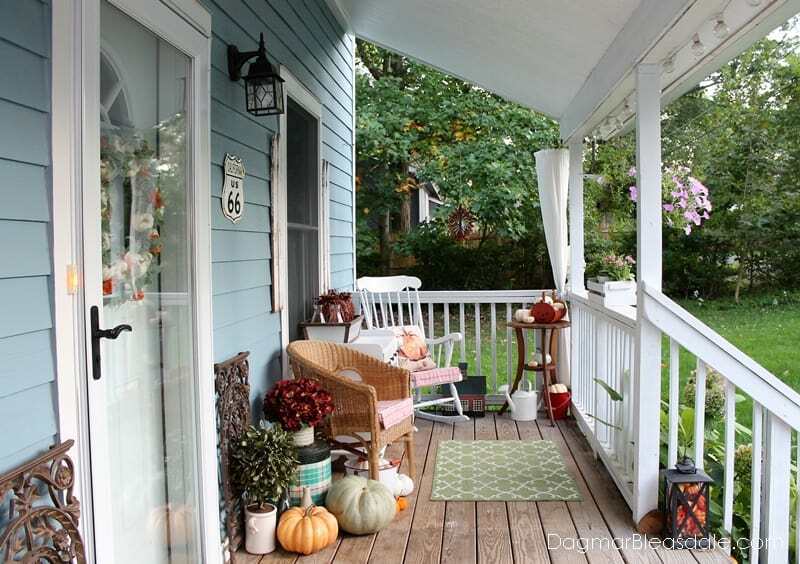 She gave it to us a few years ago, and I knew I wanted to put in on the porch. 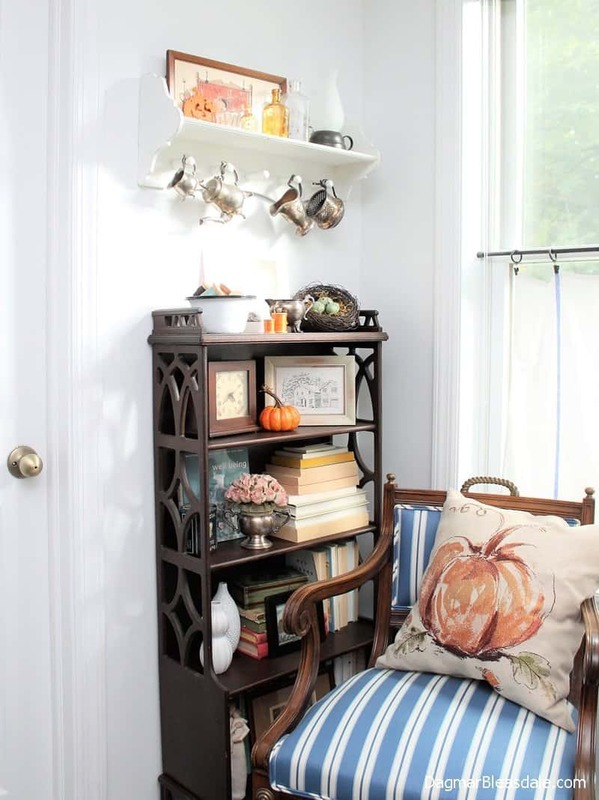 I got rid of the large rattan storage piece that you can see in this home tour from 2015 to make space for it. The leaves are just turning here in New York, but my hanging plants I bought at the start of the summer still have a lot of flowers. 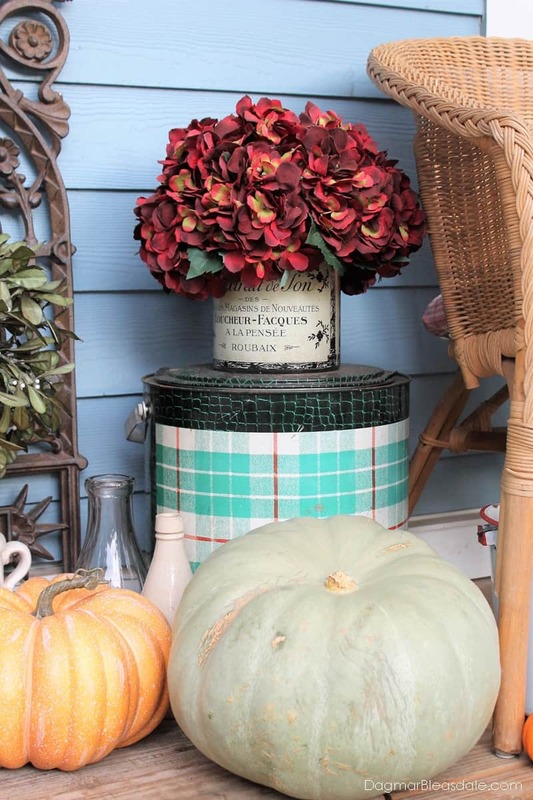 I filled our lanterns again with faux fall leaves and pumpkins, like last year. You can see that our hydrangeas have turned purple-beige since it got colder. They are huge this year and I plan to dry them again like I did last year. If you want to know how I dry them in just three days, here is the post. 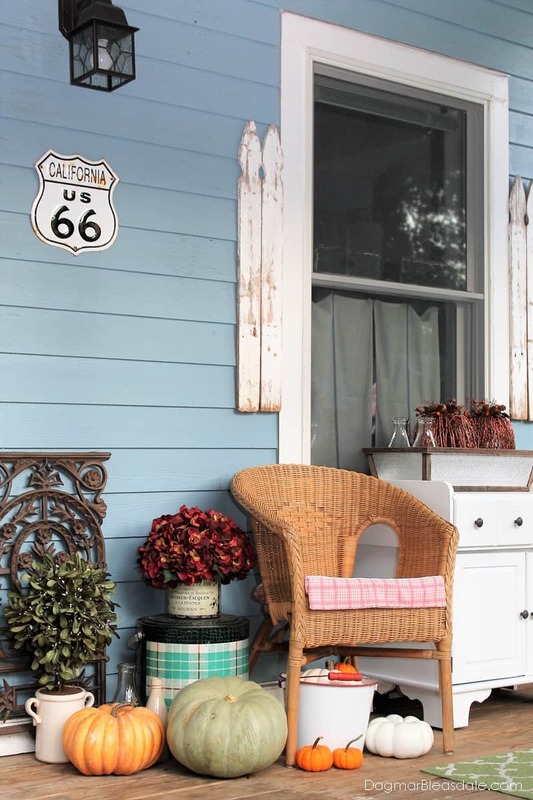 Do you remember when I added these “shutters” made out of vintage picket posts – with just Command strips exactly a year ago? They are still doing great. 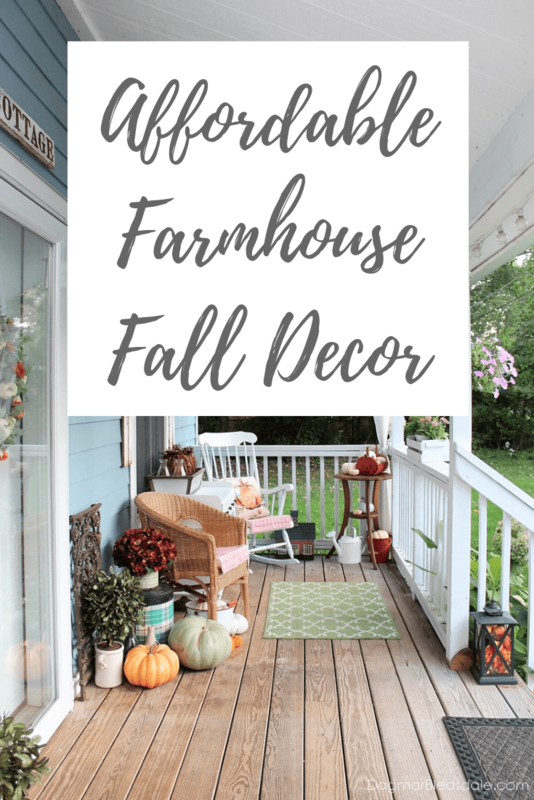 It was a lot of fun to buy a few new things, to see what I wanted to reuse from my fall decor I already had, to style it, and photograph everything for this fall home tour. Editing all the photos: not so much fun. Fall is definitely my favorite time of year. It gets a bit chilly, I get out the heavier duvet covers and my sweaters, and you just can’t beat all the fall foliage here in the beautiful Hudson Valley in New York. 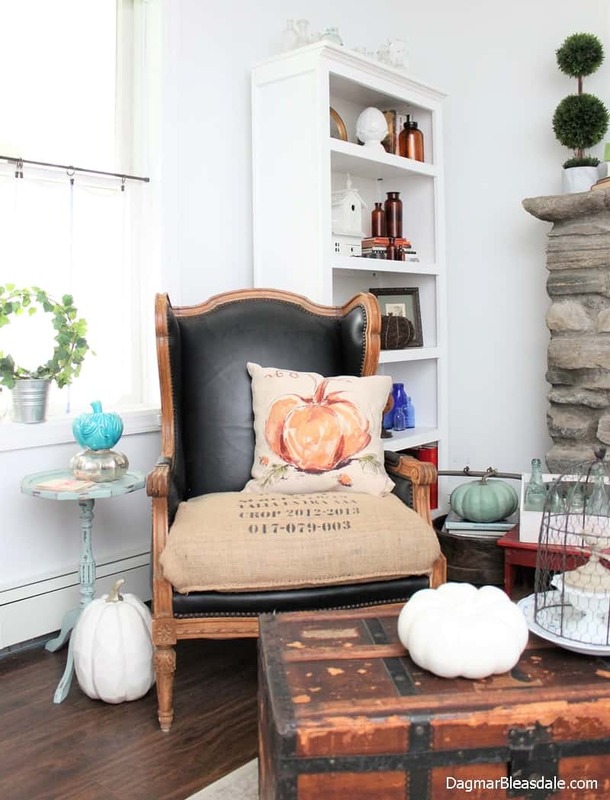 I already blogged about this cute pumpkin pillow. Last year’s fall tour theme was neutral with some blue and green, and I totally avoided orange. The theme I went with this year is A Bit of Everything. A little bit of rustic – I’ll show you the fun wooden cutlery I found in a second — a bit of white, blue, and a touch of orange. 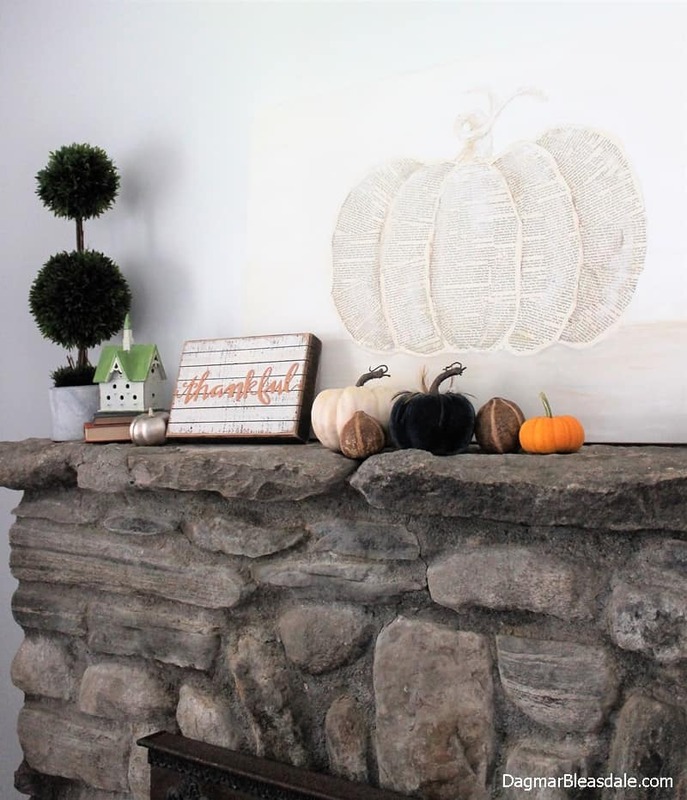 I pulled out my favorite pumpkin painting my friend Kelly made for me a few years ago, bought a few little velvet pumpkins, and reused my gold pumpkins. 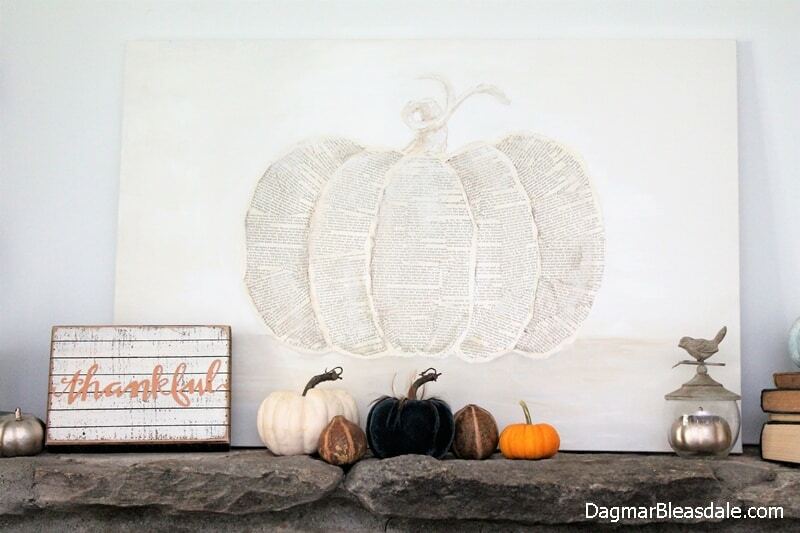 The “thankful” sign is new, and from HomeGoods. You can find similar ones on Amazon. I mixed some large real pumpkins with many fake ones. Oh, and I also found these felted orange pumpkins at HomeGoods. 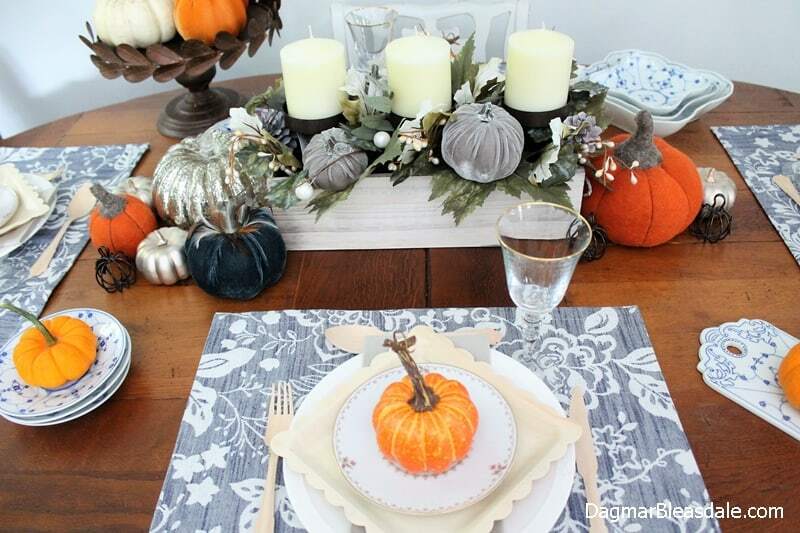 The placemats are from Kohls, and the blue in it gave me the idea to add my antique blue and white dishes from Germany to this year’s tablescape. 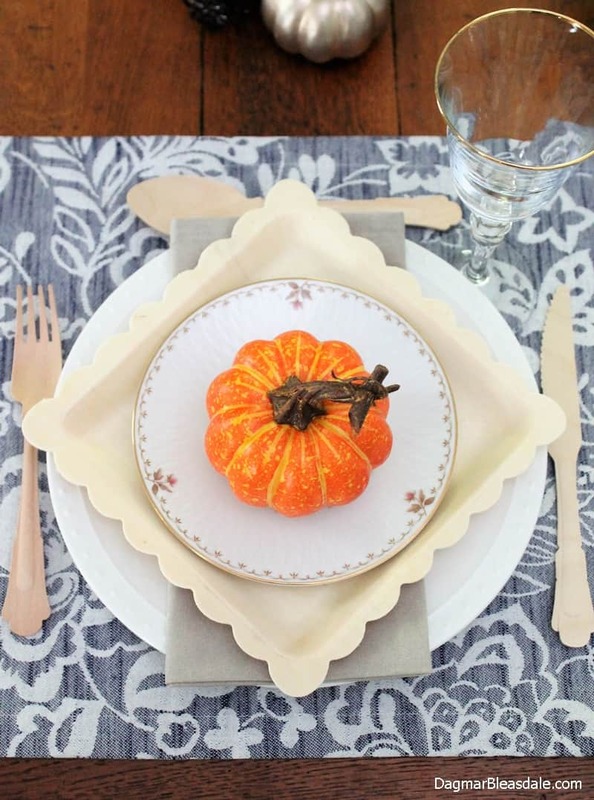 I bought these wooden plates and cutlery a while ago and thought they are so unique that I wanted to find a way to incorporate them. The white plates are from Pier 1, and the small plates are vintage. 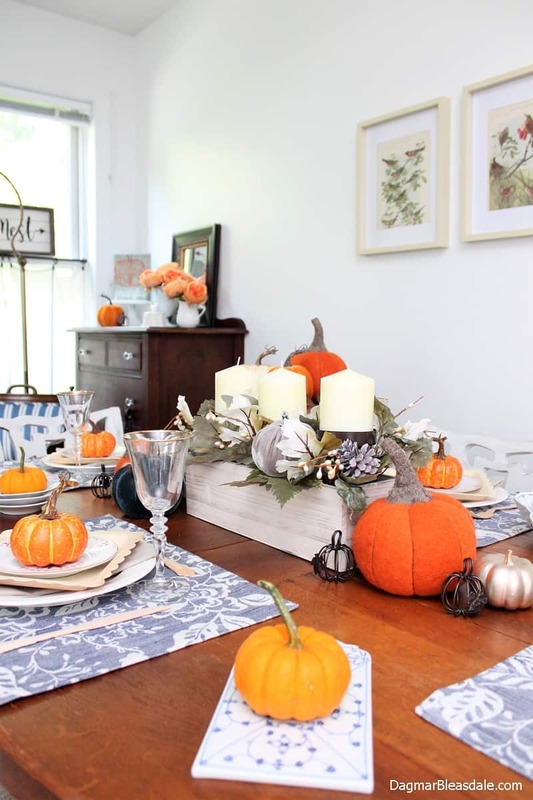 Aren’t those little wire pumpkins the cutest? They are place card holders. 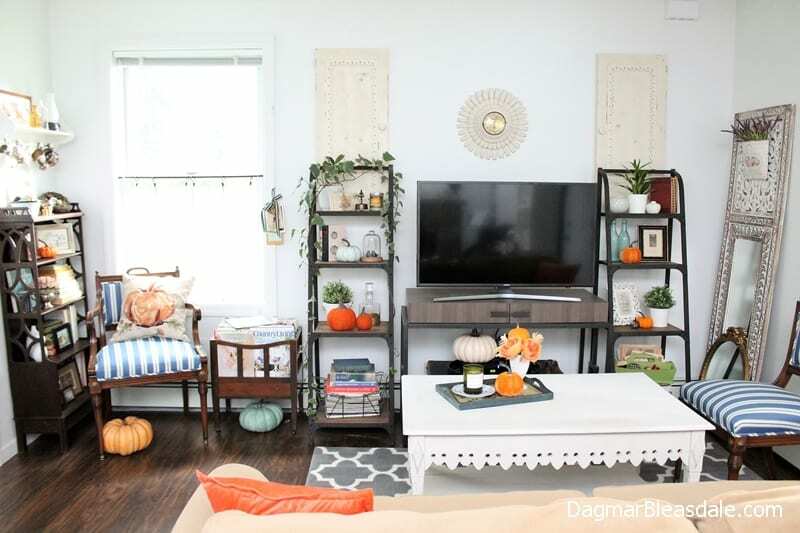 This is what the other side of our living room looks like. 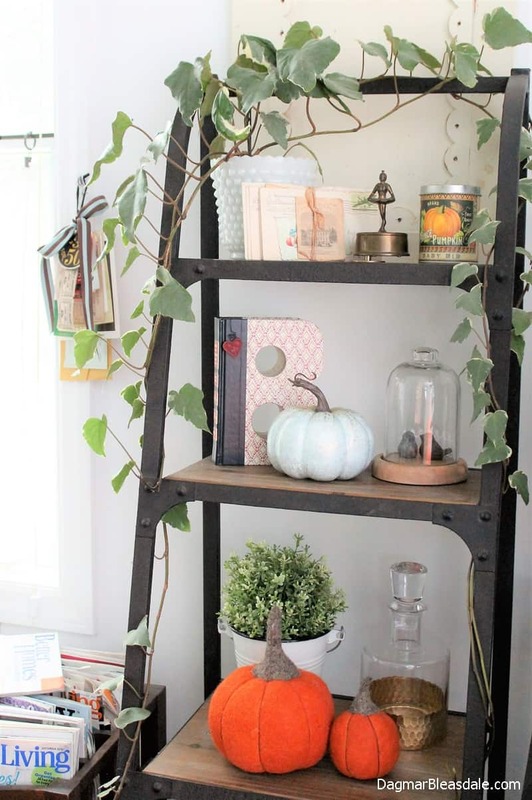 Somehow I keep that ivy plant alive, and it keeps growing around the book shelf, so I’m just letting it do its thing. I framed a vintage fall postcard and a little collage I created with some cardstock pieces. There you go! 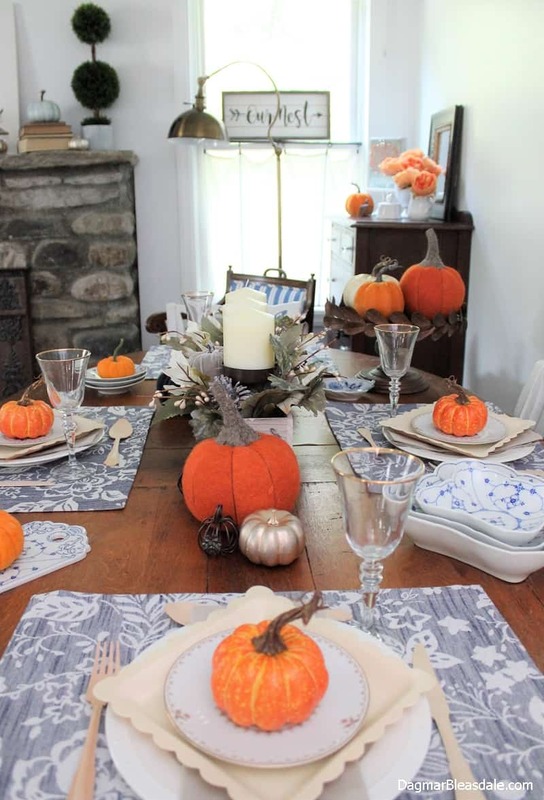 I hope you enjoyed the tour of our Blue Cottage all decorated for fall. It’s lovely and so homey. You didn’t mention those plump salmon colored roses. I’m assuming they are artificial. My mother used to make roses from both tissue paper and organdy MANY years ago. She’s been gone now for 20+ years and they reminded me of her flowers. 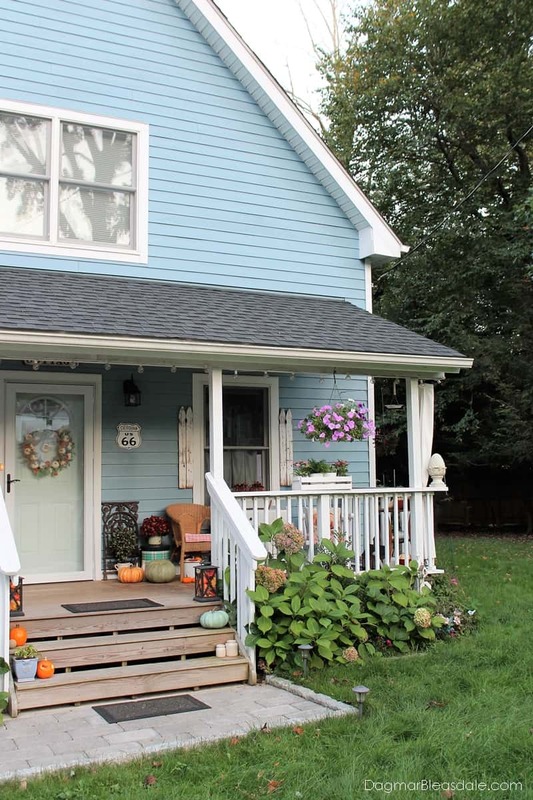 You have a cozy sweet cottage, that’s for sure. 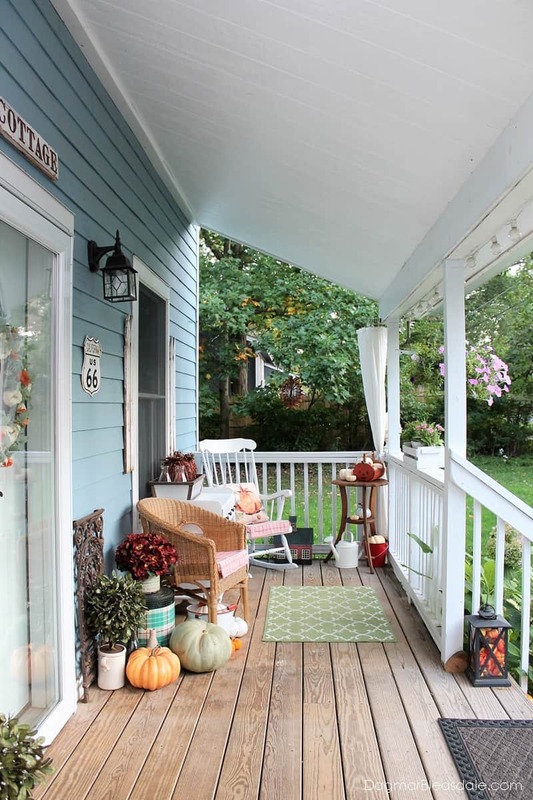 Enjoyed looking at everything, from your porch to the inside. 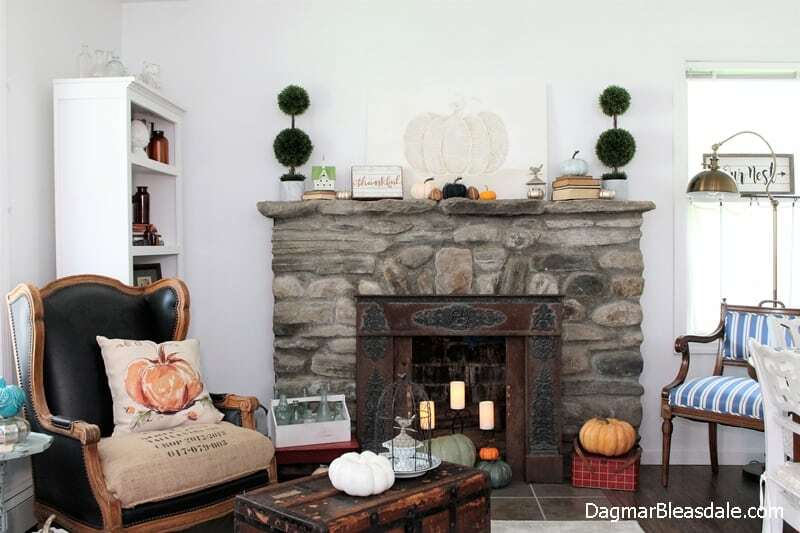 Love that fireplace surround! Did you make that or find it somewhere? It’s gorgeous! 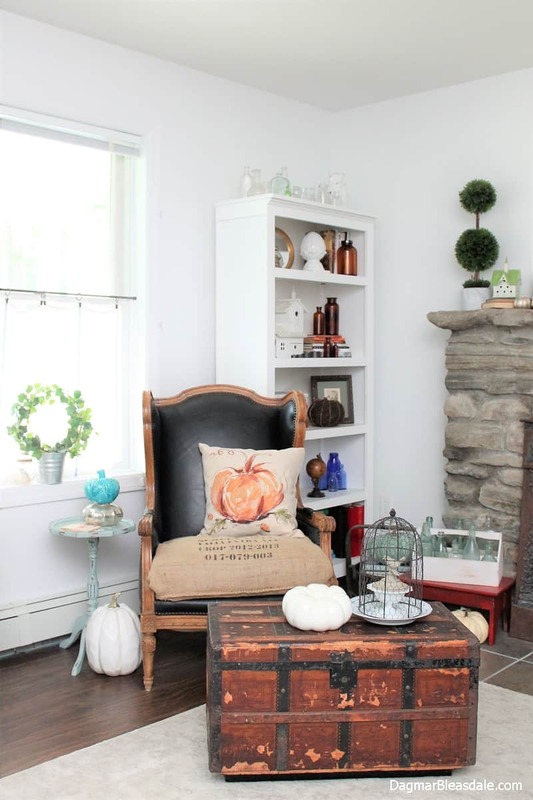 Love the stone Fireplace too! 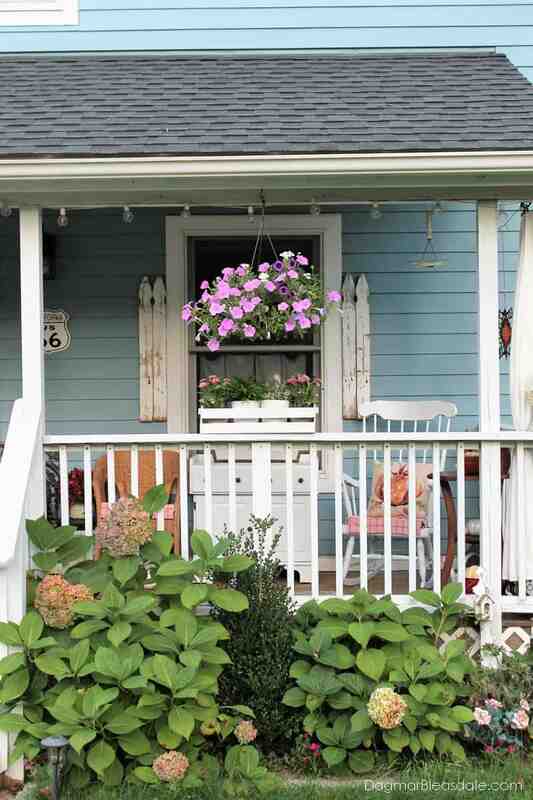 Love the picket Shutters on the porch! The table is pretty. A lovely tour! Me, I wouldn’t try doing an inside tour, but this year, I’m doing one of the porch. 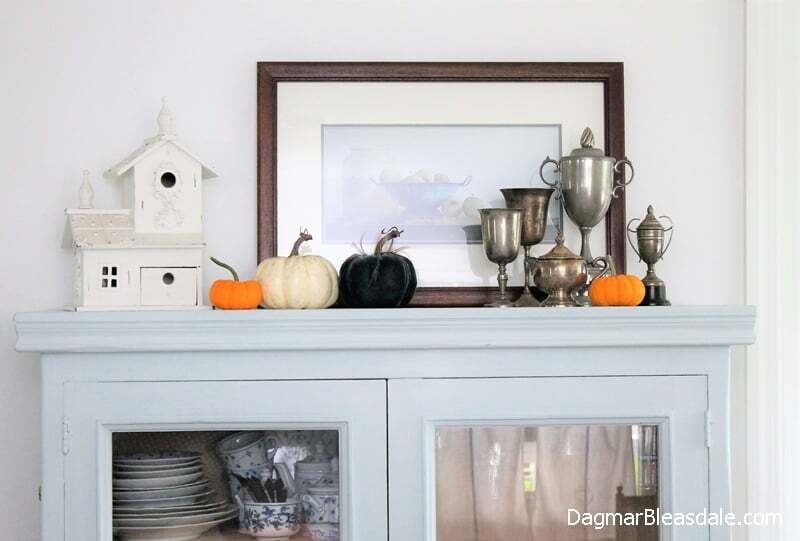 What a beautiful and, I can tell, well-loved home you’ve made, Dagmar. 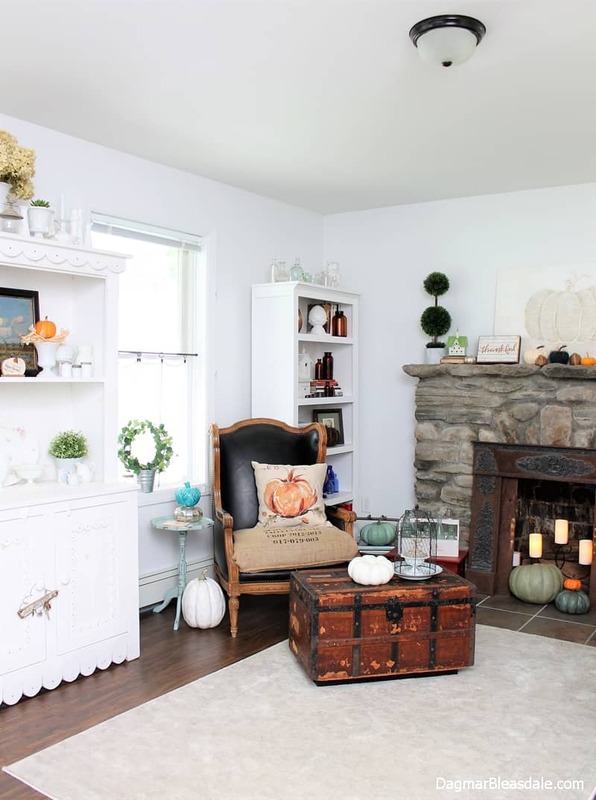 I absolutely love the fireplace. It’s one-of-a-kind with it’s gorgeous design work around the fire box. 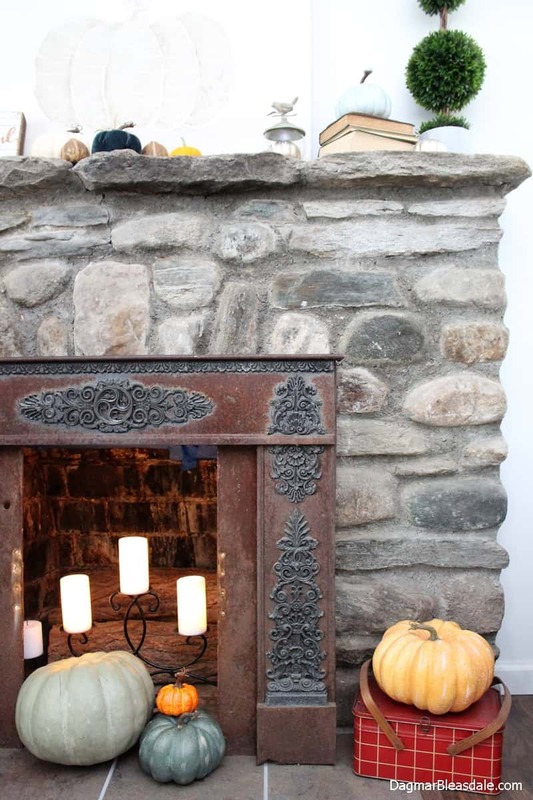 I want a fireplace so badly. I’d settle for just a mantle even! 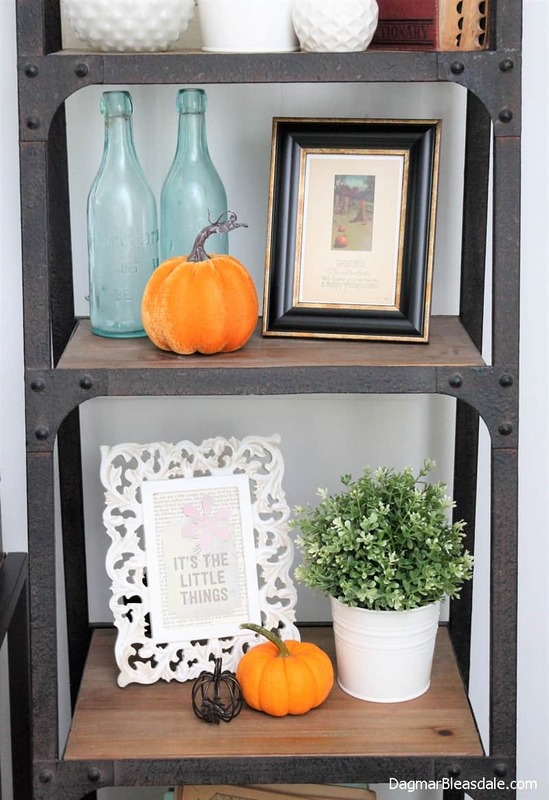 I think my favorite part of your decor are all the interesting little things to look at on your many shelves. I noticed two little white churches that reminded me of the small white houses that are sometimes used in Christmas decor. I’ve been trying to remember what they are called. They have a specific name. Do you happen to know what it is? I’d like to try making some for my holiday decorating this year. Oh, the other thing that is my second favorite in your post is those unbelievable hydrangea blossoms. 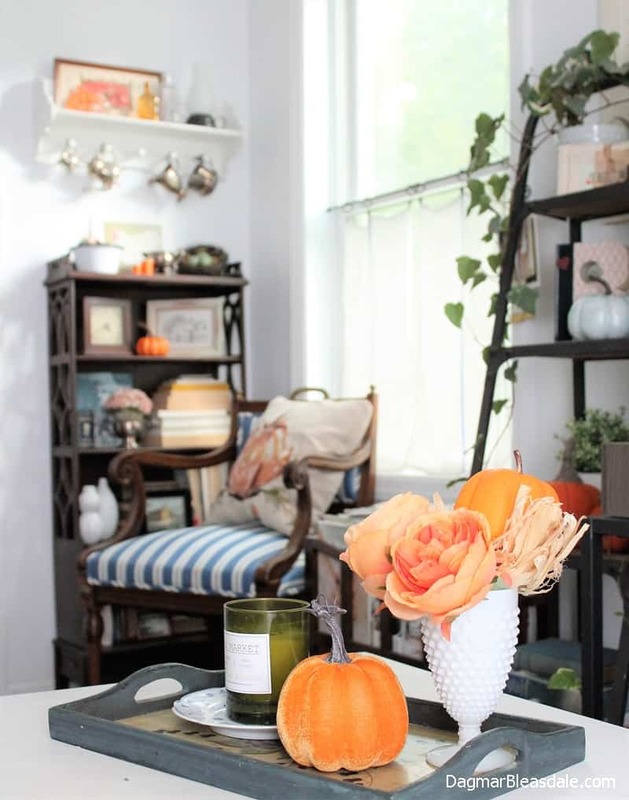 They will make for some lovely blooms for later decorating. Hey Girl. I loved the fall tour. Going to put it in my home tour Pinterest board. 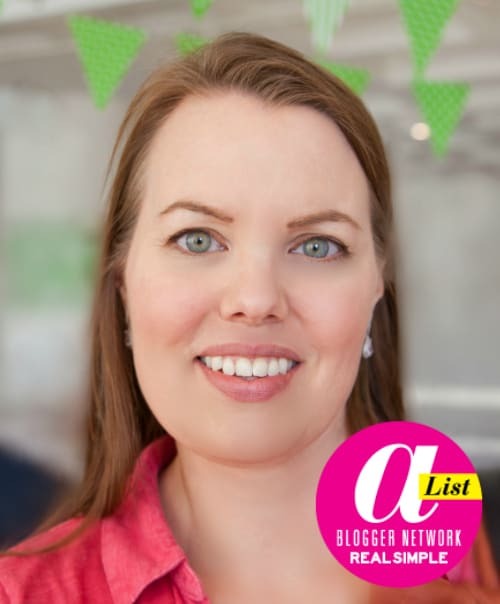 Dagmar! 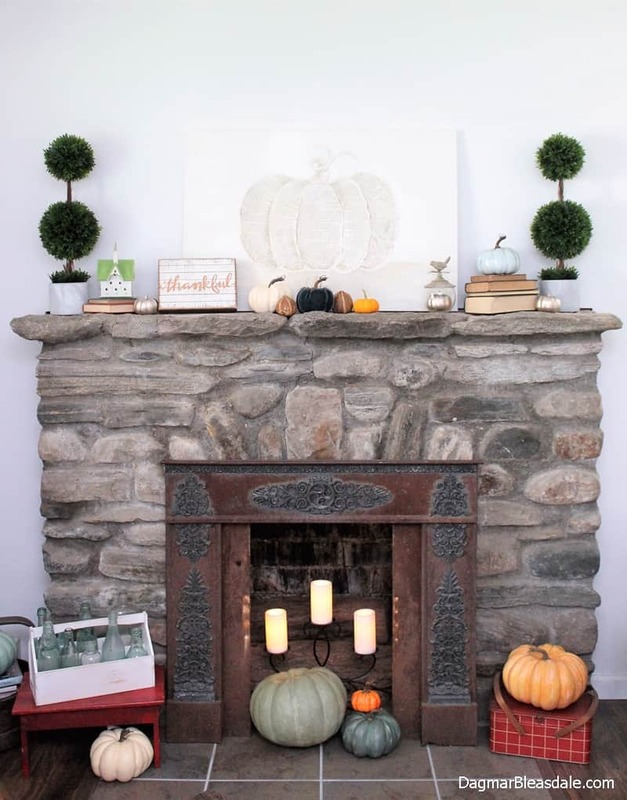 I’ve loved watching your decorate your home all these years! Happy Fall! Lovely! 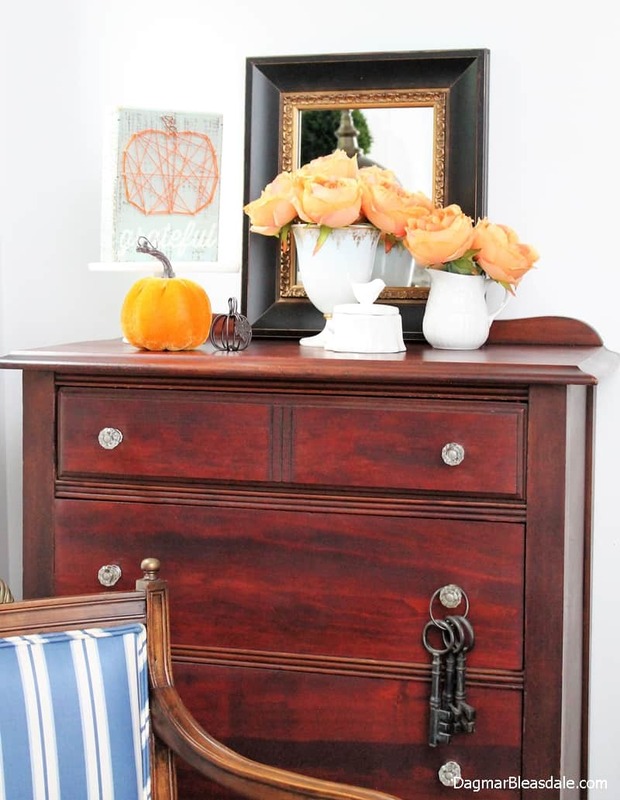 How lovely and elegant everything is in your home. 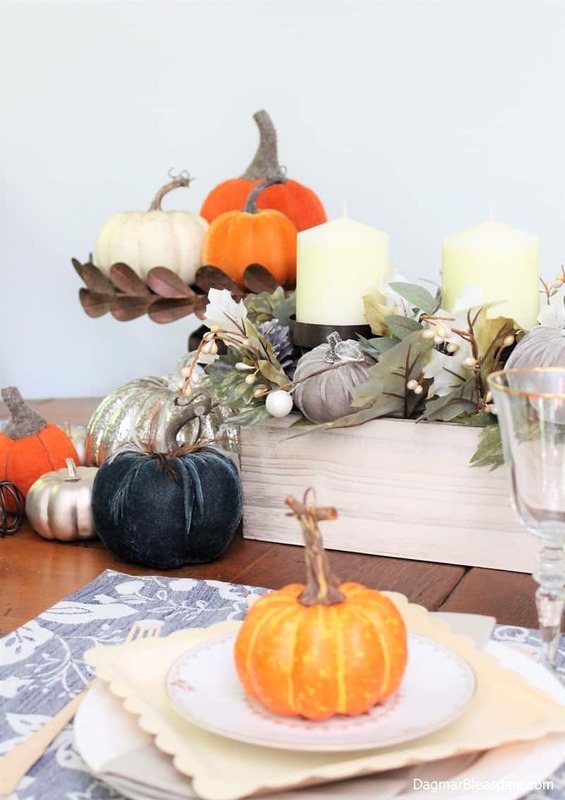 I love all the different colors of the pumpkins. Thank you for sharing. 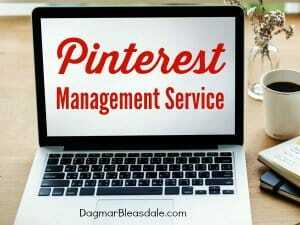 It all looks lovely Dagmar! 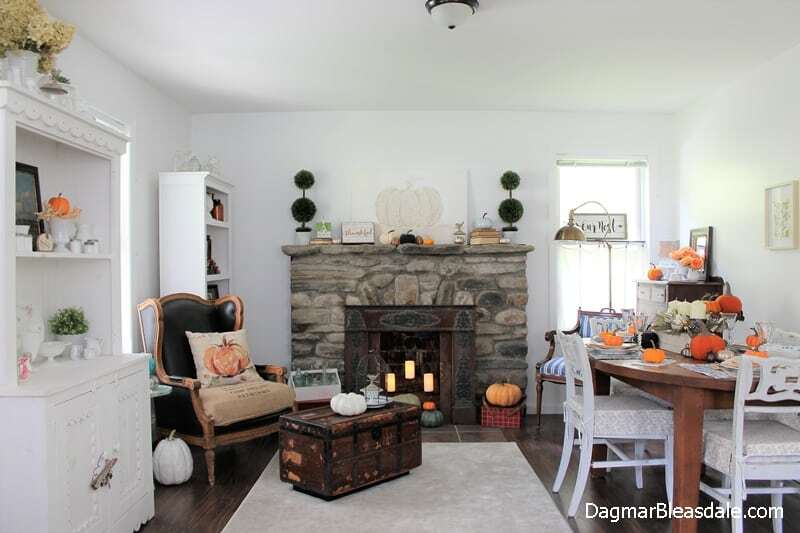 My favorite is the table but i seriously love the fireplace and that surround at the bottom is gorgeous. 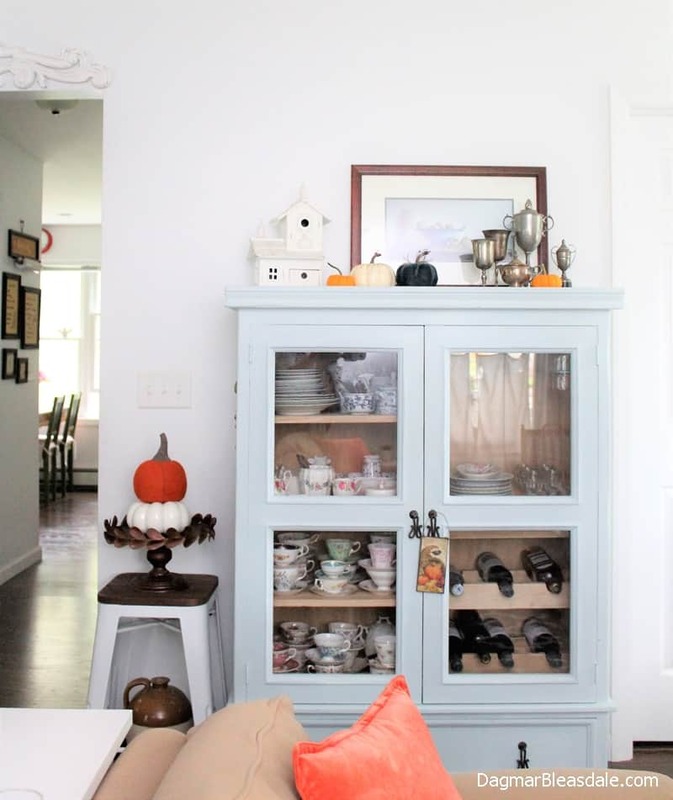 Love seeing your teacup and saucer collection too. I’m loving all the Different colored pumpkins. So cute! Thanks, Jen, for coming by!